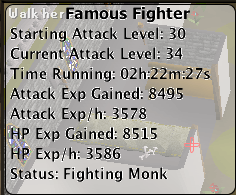 Famous Fighter is an OSRS AIO Fighter designed to be fast and customizable. Woop woop, a new fighter! Thanks! Give it a try and let me know what you think. 1122 The script will automatically stop after 4 hours. VIP subscribers and Premium scripts have no time limits. That's very strange...I'll look into it soon when I have the time. Fixed the problem. Had to do with downgrading some Java code. Script stops after a while for no reason? ps. Can you maybe at that the script will stop/switch attack styles at a certain level? 2303 The script will automatically stop after 4 hours. VIP subscribers and Premium scripts have no time limits. 2308 The script will automatically stop after 4 hours. VIP subscribers and Premium scripts have no time limits. 2317 The script will automatically stop after 4 hours. VIP subscribers and Premium scripts have no time limits. 2323 The script will automatically stop after 4 hours. VIP subscribers and Premium scripts have no time limits. Great script so far! Thank you for writing a fighter script that works. Much appreciated! 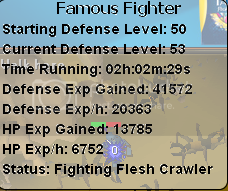 2 hour proggy, still running strong, eating swordfish. Works great! Thanks for the feedback. I'll look into it. Yes, I can add that feature in soon. Hey [member=Famous], will you be supporting range training, including being able to set a safe spot tile? Just needs to run back to this tile after attacking monster to avoid damage. Also be able to attack monsters no 'reachable' by walking if they are behind a fence etc.